Ready for Greece in Nice? Skip the line and explore Villa Kérylos, a reconstruction of an old Greek dwelling and a tribute to Greek civilization on the pretty, rocky tip of the Baie des Fourmis. 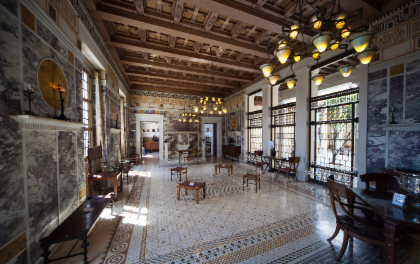 Enter the villa and see how people in Ancient Greece really lived.Take the fast track entrance and explore Villa Kérylos in Nice. Based on the noble houses originally built on the Island of Delos (2nd century BC), Villa Kérylos is the realization of archaeologist and French statesman Théodore Reinach.Enter the big inner courtyard, surrounded by 12 marble columns. Visit the staterooms on the ground floor and the upstairs bedrooms and bathrooms.Note how they've combined ancient luxuries with the modern comforts of Belle Epoque villas. Ancient stucco, Carrara marble and exotic wood blend with the gorgeous mosaics and frescoes inspired by famous scenes featuring gods and classic Greek heroes.